2 Kings 14:7 He killed of Edom in the Valley of Salt ten thousand, and took Sela by war, and called its name Joktheel, to this day. 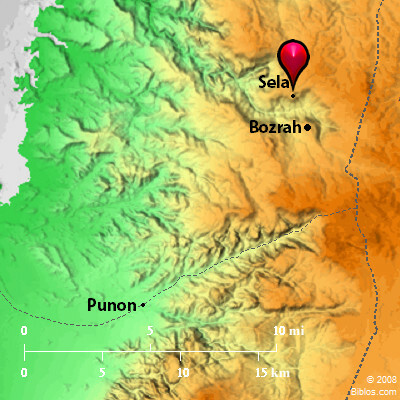 se'-la (sela`, ha-cela` (with the article); petra, he petra; the King James Version Selah (2 Kings 14:7)): English Versions of the Bible renders this as the name of a city in 2 Kings 14:7 Isaiah 16:1. In Judges 1:36 2 Chronicles 25:12; and Obadiah 1:3, it translates literally, "rock"; but the Revised Version margin in each case "Sela." It is impossible to assume with Hull (HD B, under the word) that this name, when it appears in Scripture, always refers to the capital of Edom, the great city in Wady Musa. In Judges 1:36 its association with the Ascent of Akrabbim shuts us up to a position toward the southwestern end of the Dead Sea. Probably in that case it does not denote a city, but some prominent crag. Moore ("Judges," ICC, 56), following Buhl, would identify it with es-Safieh, "a bare and dazzlingly white sandstone promontory 1,000 ft. high, East of the mud fiats of es-Sebkah, and 2 miles South of the Dead Sea." A more probable identification is a high cliff which commands the road leading from Wady el-Milh, "valley of Salt," to Edom, over the pass of Akrabbim. This was a position of strategic importance, and if fortified would be of great strength. (In this passage "Edomites" must be read for "Amorites.") The victory of Amaziah was won in the Valley of Salt. He would naturally turn his arms at once against this stronghold (2 Kings 14:7); and it may well be the rock from the top of which he hurled his prisoners (2 Chronicles 25:12). He called it Jokteel, a name the meaning of which is obscure. Possibly it is the same as Jekuthiel (1 Chronicles 4:18), and may mean "preservation of God" (OHL, under the word). No trace of this name has been found. The narratives in which the place is mentioned put identification with Petra out of the question. "The rock" (the Revised Version margin "Sela") in Obadiah 1:3, in the phrase "thou that dwellest in the clefts of the rock." is only a vivid and picturesque description of Mt. Edom. "The purple mountains into which the wild sons of Esau clambered run out from Syria upon the desert, some hundred miles by twenty, of porphyry and red sandstone. They are said to be the finest rock scenery in the world. `Salvator Rosa never conceived so savage and so suitable a haunt for banditti.'.... The interior is reached by defiles so narrow that two horsemen may scarcely ride abreast, and the sun is shut out by the overhanging rocks..... Little else than wild fowls' nests are, the villages: human eyries perched on high shelves or hidden away in caves at the ends of the deep gorges" (G. A. Smith. The Book of the Twelve Prophets. II. 178). In Isaiah 16:1; Isaiah 42:11 the Revised Version (British and American), perhaps we have a reference to the great city of Petra. Josephus (Ant., IV, vii, 1) tells us that among the kings of the Midianites who fell before Moses was one Rekem, king of Rekem (akre, or rekeme), the city deriving its name from its founder. This he says was the Arabic name; the Greeks called it Petra. Eusebius, Onomasticon says Petra is a city of Arabia in the land of Edom. It is called Jechthoel; but the Syrians call it Rekem. Jokteel, as we have seen, must be sought elsewhere. There can be no doubt that Josephus intended the city in Wady Musa. Its Old Testament name was Bozrah (Amos 1:12, etc.). Wetzstein (Excursus in Delitzsch's Isaiah, 696;) hazards the conjecture that the complete ancient nine was Bozrat has-Sela, "Bozrah of the Rock." This "rose-red city half as old as Time"
Sela was for long difficult of access, and the attempt to visit it was fraught with danger. In recent years, however, it has been seen by many tourists and exploring parties. Of the descriptions written the best is undoubtedly that of Professor Dalman of Jerusalem (Petra und seine Felsheiligtumer, Leipzig, 1908). An excellent account of this wonderful city, brightly and interestingly written, will be found in Libbey and Hoskins' book (The Jordan Valley and Petra, New York and London, 1905; see also National Geographic Magazine, May, 1907, Washington, D.C.). The ruins lie along the sides of a spacious hollow surrounded by the many-hued cliffs of Edom, just before they sink into the Arabah on the West. It is near the base of Jebel Harun, about 50 miles from the Dead Sea, and just North of the watershed between that sea and the Gulf of Akaba. The valley owes its modern name, Wady Musa, "Valley of Moses," to its connection with Moses in Mohammedan legends. While not wholly inaccessible from other directions, the two usual approaches are that from the Southwest by a rough path, partly artificial, and that from the East. The latter is by far the more important. The valley closes to the East, the only opening being through a deep and narrow defile, called the Sik, "shaft," about a mile in length. In the bottom of the Sik flows westward the stream that rises at `Ain Musa, East of the cleft is the village of Elji, an ancient site, corresponding to Gaia of Eusebius (Onomasticon). Passing this village, the road threads its way along the shadowy winding gorge, overhung by lofty cliffs. When the valley is reached, a sight of extraordinary beauty and impressiveness opens to the beholder. The temples, the tombs, theater, etc., hewn with great skill and infinite pains from the living rock, have defied to an astonishing degree the tooth of time, many of the carvings being as fresh as if they had been cut yesterday. An idea of the scale on which the work was done may be gathered from the size of theater, which furnished accommodation for no fewer than 3,000 spectators. Such a position could not have been overlooked in ancient times; and we are safe to assume that a city of importance must always have existed here. It is under the Nabateans, however, that Petra begins to play a prominent part in history. This people took possession about the end of the 4th century B.C., and continued their sway until overcome by Hadrian, who gave his own name to the city-Hadriana. This name, however, soon disappeared. Under the Romans Petra saw the days of her greatest splendor. According to old tradition Paul visited Petra when he went into Arabia (Galatians 1:17). Of this there is no certainty; but Christianity was early introduced, and the city became the seat of a bishopric. Under the Nabateans she was the center of the great caravan trade of that time. The merchandise of the East was brought hither; and hence, set out the caravans for the South, the West, and the North. The great highway across the desert to the Persian Gulf was practically in her hands. The fall of the Nabatean power gave Palmyra her chance; and her supremacy in the commerce of Northern Arabia dates from that time. Petra shared in the declining fortunes of Rome; and her death blow was dealt by the conquering Moslems, who desolated Arabia Petrea in 629-32 A.D. The place now furnishes a retreat for a few poor Bedawy families.